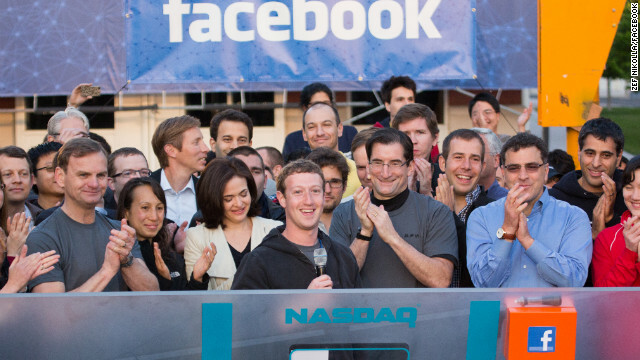 Mark Zuckerberg rings the Nasdaq opening bell on Friday. Fresh-faced 27-year-old Mark Zuckerberg wore a hoodie rather than a shirt and tie to meet with potential investors for Facebook's IPO this week, to the consternation of well-dressed financial analysts everywhere. With his decidedly casual wardrobe, Zuck has entered the pantheon of great and nerdy technological entrepreneurs, famous in part for the "uniforms" they wore. Steve Jobs' closets full of black turtlenecks, jeans and sneakers were endearing and disarming. While convenient, it disguised the ambitious genius wearing them. Bill Gates' unkempt hair and safety-style specs helped cement his image as a nerd-terrible just as much as his ubiquitous operating system did. Steve Wozniak's out-of-date-and-frumpy wardrobe from the 1980s and 1990s gave him the air of the lovable wunderkind, jovial and enthusiastic about computers, not necessarily fashion. And Zuckerberg wears a hooded sweatshirt, riling up the suited financial analysts who would like to control his money. They even called him immature. In an editorial on CNN.com, Benjamin Nugent contended that nerds like Zuckerberg have no time to deliberate on their wardrobe because their minds are consumed with their work. Whether it's computer programming or art, Nugent said nerds are so singularly focused that they are unconscious of the visual impression they make. That social machinations like being presentable don't enter their head space - they make spastic movements, have childlike laughs, even dress like homeless people, he said. Nugent, the author of "American Nerd: The story of my people," said: "He's first and foremost an inventor, a tinkerer in a workshop, a monk in hooded robes. Sales, the bottom line, these are not the things that define me, the hoodie says." It's a savvy hoodie.